Sorry, Mary-Lou - It Turns Out I Prefer Turquoise. Last week I wrote about finding writing in long-hand more conducive to creative thought than writing straight onto the computer screen. Responses both here and on Twitter suggest a 60-40 split in favour of the pen. For those of you who enjoy handwriting, my question is - which pen? I have to confess to a weakness for fountain pens. My favourite is a beautiful Parker pen, which was given to me by my colleagues at the school where I taught before we moved to Wales. One of the joys of using a fountain pen is the gorgeous inks you can buy these days. We've come a long way from the blue, blue-black and black I remember from my schooldays. At the school I went to, we used blue. Every class had its own bottle and the ink monitors came round on Friday mornings to top them up. Did you read Malory Towers? 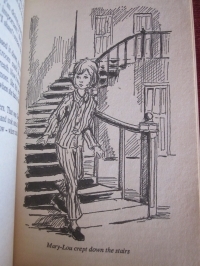 In First Term at Malory Towers, Gwendoline stamps on Mary-Lou's fountain pen in a fit of spite, then smears tell-tale violet ink on the soles of Darrell's shoes so she gets the blame. Mousy Mary-Lou braves the dark to creep downstairs and find the real stained shoes and prove Darrell's innocence. From the moment of reading that episode for the first time, I longed for violet ink. As an adult, I had not only violet ink but also a violet pen - in fact, two violet pens; a fountain pen given to me by my husband and a cartridge pen from my best friend. And I wrote in my beloved violet for a long time. Until I discovered turquoise. Is there any ink prettier than turquoise? Do you like different coloured inks? Or do you have a favourite pen? Or was there something in a childhood story that you ached for? The other thing I wanted, after reading a circus story, was a bear. A real one. And I wouldn't have said no to an island like George's in the Famous Five books. Good for you, writing to your MP, Cathy! I tend to associate green ink with marking - that was the colour we used at my last school - but I have a friend who writes with a green fountain pen with green ink in a green-bound notebook. Glad you enjoyed the post, Cathy. Thanks as always for commenting. I'm quite keen on my Pilot V7 Hi-Tecpoint 0.7 with pure liquid ink in a beautiful shade of green. Especially for writing letters to my MP! Great blogpost again Susanna but somehow Mallory Towers has passed me by. Think I've missed a good series there. I remember those pens with the different coloured nibs that clicked into position. I had one, too. I think it was a Christmas stocking filler. I sympathise with the difficulties you have with a fountain pen. A friend of mine at school was left-handed and, since the use of fountain pens was compulsory, she developed a technique which involved curling her left arm around the page so that instead of writing with her pen underneath the writing, like we righties did, she had her pen above the writing. Your post made me smile, Susanna. 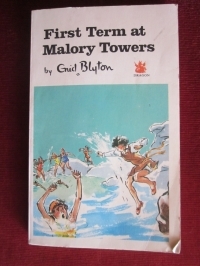 I didn't read 'Malory Towers' as a child so read it first with English Rose who sadly, wasn't impressed. I had a 'four colour' pen at school which was a favourite, and now as an adult, have a special pen I use for journal writing. No violet ink, though, although I also remember having a pen which had pink, scented ink! No fountain pens, though, as being left-handed, the ink smears across the page. After reading so many English children's stories growing up, I longed to see England for myself...and here I am! I'm sure that those wonderful boarding school stories had the same effect on all of us, Jackie. Glad you enjoyed the reminder about Mary-Lou. Thanks for dropping by.